Green Recycling Solutions, LLC recently joined the WasteWORKS family and we’re proud to be a part of their new recycling facility operations in Maysville, NC. They were also kind enough to provide the following information about their operations. Green Recycling Solutions, LLC was formed in 2011. The concept behind the business plan was to recycle construction and demolition material and what we could not recycle would go into our construction and demolition landfill. The landfill was constructed utilizing the latest landfill requirements as dictated by NCDENR. This is the first landfill constructed under the new laws enacted by the North Carolina legislature in 2007. What makes our business model different is the use of the recycling component coupled with an onsite landfill. This is the first one in the North Carolina utilizing the new requirements for the landfill with the recycling component sitting in front of the landfill. Our focus is to recycle as much of the product as we can. The more efficient that we are, the longer our landfill will last. 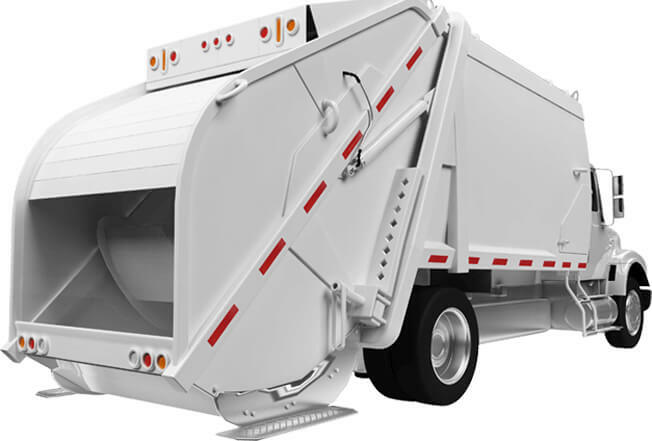 Our landfill was designed to last for thirty years when recycling about 65% of our product. So far, we have been able to meet our goal since we opened in November, 2014. New businesses continue to sprout from the recycling of our products. Currently, we are grinding our wood and doing colorized mulch. There are other avenues that we see for the wood product. There is also an opportunity to create wood pellets and composting. We bale our cardboard and sell it to Sonoco, and we sell our metal to a local company in Jacksonville. Our concrete is crushed and sold to the local logging market and to others in need of rock. We are working on grinding our sheetrock so we can have it tested by NC Ag. If tests are good, then we will sell back to the local farmers. We are located in the Town of Maysville which is in Jones County. Most of our employees are from the immediate area. We have eighteen employees at this time and we are looking to add more in the near future. The town and county have both been very good to work with. We have recently been awarded Business of the Quarter by the Town of Maysville. We have also been fortunate enough to be awarded several grants to help us with our infrastructure, including two grants by RBAC for equipment purchases. 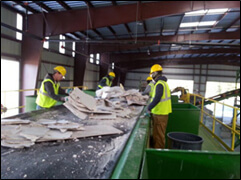 Our recycling building and equipment makes our facility one of the premier sites in the recycling business for construction and demolition debris in North Carolina. We have been visited by several counties to view our facility and recently one of the counties that viewed our site has purchased the same equipment for processing. Our software package, WasteWORKS-SQL has been very beneficial in helping us keep up with our daily totals and has been one part of increasing the efficiency of our business. I get my results fast and I am able to view daily reports. It is customer friendly and our customers like the billing process. Another key ingredient is the ease of unloading the debris into the recycling building. From the time a truck hits the scales and returns to be weighed out is about eight minutes. There are no flat tires as all trucks remain on asphalt or concrete at all times.